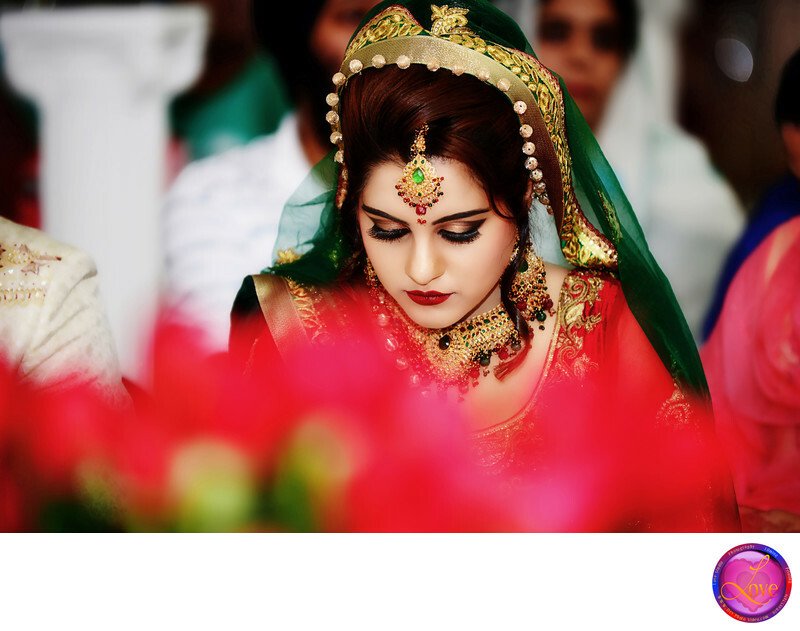 It was a middle of the day when the wedding ceremony of Jazveen and Gagandeep took place at the Temple named Gurdwara Sahib Sikh Study Circle, in the city of Stone Mountain, Georgia. I am accomplished and acquainted with Sikh tradition, culture, religion and weddings, so nothing happened surprisingly. The priests were singing with the Indian musical instrument Tabla and Harmonium during the ceremony. The bride, groom, and all the guests were paying their respect according to the Sikh religion by lowering their head and eyes with complete silence during that time. The bride was dressing up in a red Blouse with green golden Lehenga. She was sitting along with her sister, mother, father, cousins and husband-to-be. There were bunches of red beautiful roses around the chanting stage or center piece. As wedding photographer, I am permitted to walk around and take pictures, but I could not get close because there is no access; people were sitting all over the floor with praying silently. I crawled carefully and took position behind the stage. I used Nikon D800 camera with Nikon 70-200 F2.8 lens attached to it. At the F2.8, I melted the red roses in front of the subject and focused on her face. I love this picture. The bride, groom and their family adore this photograph also. Red roses have been melted with the red blouse of the bride creating a very artistic and natural effect. Location: Gurdwara Sahib Sikh Study Circle: 1821 S Hairston Rd, Stone Mountain, GA 30088 Phone:(770) 808-6320.